Remove the memory SO-DIMM modules. 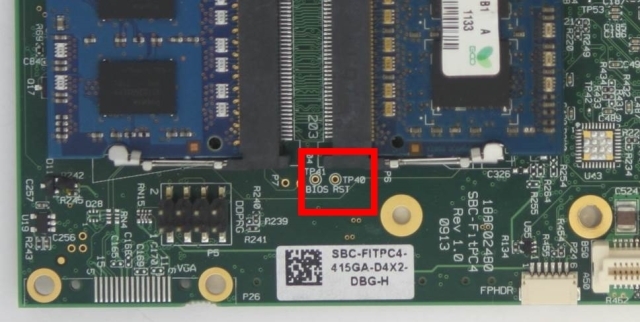 Reset the BIOS by shorting two test points (TP40 and TP41) for 3 seconds located between memory slots close to an edge, as shown in the picture below. Install back the memories + the storage with the service door. Issue: When single RAM memory module being used on inner memory SO-DIMM slot (P6) it may cause the system not to pass memory initialization process. Fix: In case single RAM memory module being used, it should populate the SO-DIMM slot closer to an edge (P7) of the PCB. What type of storage being used in terms of RPM (in case of HDD)? Note that 7200rpm drives are not recommended due to lower power nature of the PC, as such drives used to overload the machine. 5400rpm drives at maximum must be used.